In Photoshop Elements, you can create multiple image layers within a single image. Even more fun is creating a composite from several different images. Take people out of boring photo studios and put them in exotic locales. The creative possibilities are endless. Click the Create a New Layer icon at the bottom of the Layers panel. Choose New Layer from the Layers panel menu. Note that if you create a layer by using either of the menu commands, you’re presented with a dialog box with options. In that dialog box, you can name your layer and specify options for grouping, blending, and adjusting opacity. Provide a name for your layer and click OK. You can always adjust the other options directly on the Layers panel later. You can also use the Copy and Paste commands without creating a blank layer first. When you copy and paste a selection without a blank layer, Elements automatically creates a new layer from the pasted selection. A better method of copying and pasting between multiple images, however, is to use the drag-and-drop method. The Copy Merged command on the Edit menu creates a merged copy of all visible layers within the selection. Grab a painting tool, such as the Brush or Pencil, and paint on the layer. Make a selection on another layer or on the background within the same document, or from another image entirely, and then choose Edit→Copy. Select your new, blank layer on the Layers panel and then choose Edit→Paste. You can also choose Select→All and then copy and paste to transfer an entire image to the new layer. Make a selection on another layer or on the background within the same document, or from another image, and then choose Edit→Cut. Select your new, blank layer and then choose Edit→Paste. Be aware that this action removes that selection from its original location and leaves a transparent hole. When you cut a selection from a layer, take note of the resulting hole in the original location. Another way to create a layer is to use the Layer via Copy and Layer via Cut commands on the Layer menu. Make a selection on a layer or background and choose Layer→New→Layer via Copy or Layer via Cut. Elements automatically creates a new layer and puts the copied or cut selection on the layer. 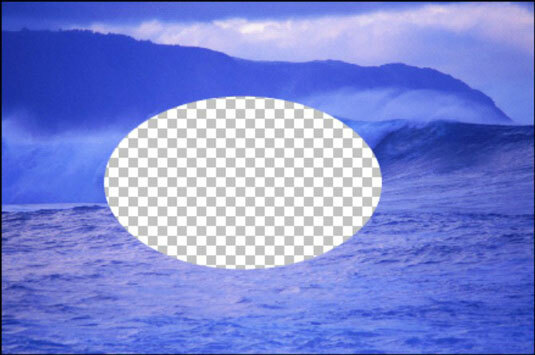 If you use the Layer via the Cut command, your selection is deleted from its original location layer, and you’re left with a transparent hole. If you use the background for the source, your background color fills the space. You can use these two commands only within the same image. You can’t use them among multiple images.